Diepenbrock makes no mention of his draft of Het daghet uyt den Oosten (The Sun Rises in the East) in his correspondence. Moreover, the manuscript bears no date, so we can only guess when and why he started this composition and never completed it. Reeser has dated Het daghet uyt den Oosten around 1890, as Diepenbrock’s handwriting and composition style are in keeping with that of other manuscripts and works from this period. The narrative of Het daghet uyt den Oosten bears resemblances with that of Heine’s ballad Es war ein alter König (There Was an Old King, RC 25). Both songs are about misfortune caused by love. Thus, it is an obvious choice to line these works up next to each other chronologically. Diepenbrock’s detailed sketch contains the first strophe of the song for voice and piano. The manuscript consists of a single sheet with writing on both sides. On the front there are four systems; the first has been crossed out. In this system the voice shares the top stave with the right hand of the piano part. Diepenbrock notated the same music on three staves at the bottom of the page. At the end of the third system he wrote: 2. Koeplet (2nd Verse). On the back are both a sketch and a neat copy of the melody, as well as a harmonic study. In Diepenbrock’s melody the contours of the popular folk melody can be found, as published by Snellaert (see Text source). Diepenbrock only manipulated the note values and metre of the melody. Later he applied this technique to the Gregorian melody of the Ave maris stella, which he incorporated in the symphonic song Im grossen Schweigen (In Great Silence, RC 67) for baritone and orchestra. 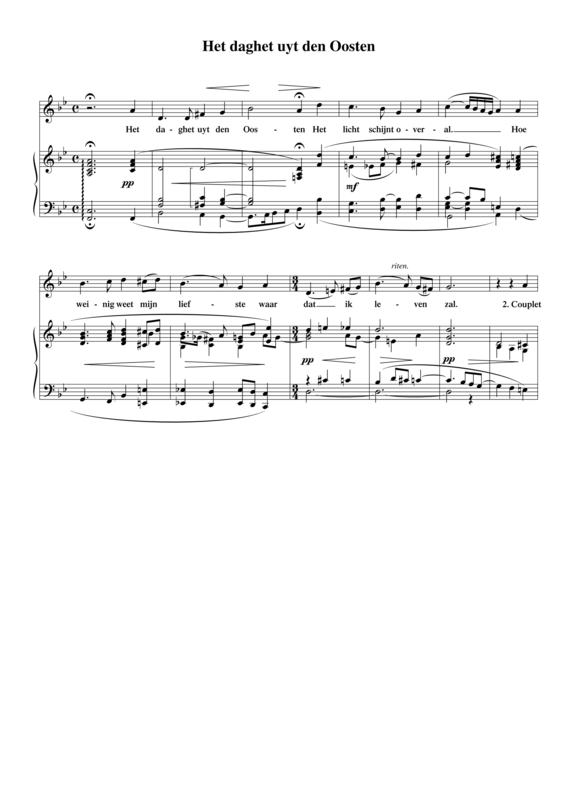 Overall, Diepenbrock’s setting of Het daghet uyt den Oosten is traditional, with the exception of the passages that are dominated by chromaticism – a trademark of his. The harmonic difference between the beginning of the first and the second strophe suggests that Diepenbrock intended the piece to be through-composed. Diepenbrock used folkloristic texts in his compositions many times, like in his Vijftiende-eeuwsch bruyloftslied (Fifteenth-Century Wedding Song, RC 10), Den uil (The Owl, RC 56) and Christus is opgestanden (Christ has Risen, RC 57). The sketch of Het daghet uyt den Oosten can be considered an attempt by Diepenbrock to nurture and celebrate his love for medieval folk culture. A quarter of a century later the opening line of this song was still in the back of Diepenbrock’s mind. In the Dutch weekly De Amsterdammer of 27 September 1914 he wrote an article entitled “Het daghet in den Oosten”, in which he lashed out against the despicable German propaganda smoothing over the burning down of the university library in Louvain and the historic centre of Dendermonde at the beginning of the First World War. Diepenbrock welcomed the German politician Karl Liebknecht’s statement that the plundering and destruction could not be justified. The sun rises in the East! (VG 272-276).